Description	 MS in Greek on papyrus, Oxyrhynchus?, Egypt, ca. 200, 8 f f. (originally ca. 74 ff. ), 20x10 cm, single column, (16x8 cm), 22-23 lines in Greek semi-cursive book script. Context	 Possibly by the same scribe as MS 2648. The 8 ff. were found tipped in between the leaves of MS 2650. The whole codex with the 27 chapters of Leviticus would have had about 74 ff. Probably from the same hoard as the Chester Beatty papyri, now in Dublin: Chester Beatty Library. Provenance	 1. Monastery in the Oxyrhynchus region, Egypt (ca. 4th c. -); 2. Antiquity dealer, Alexandria (ca. 1930); 3. Private collector, Zürich. 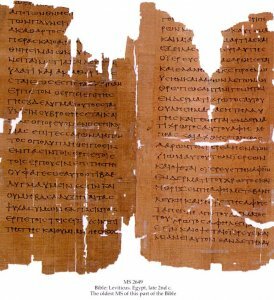 Published	 Papyrologica Florentina, vol. XXXV. Rosario Pintaudi: Papyri Graecae Schøyen (PSchøyen I). Firenze, Edizioni Gonnelli, 2005 (Manuscripts in The Schøyen Collection V: Greek papyri, vol. I), pp. 81-145, by Kristin de Troyer.